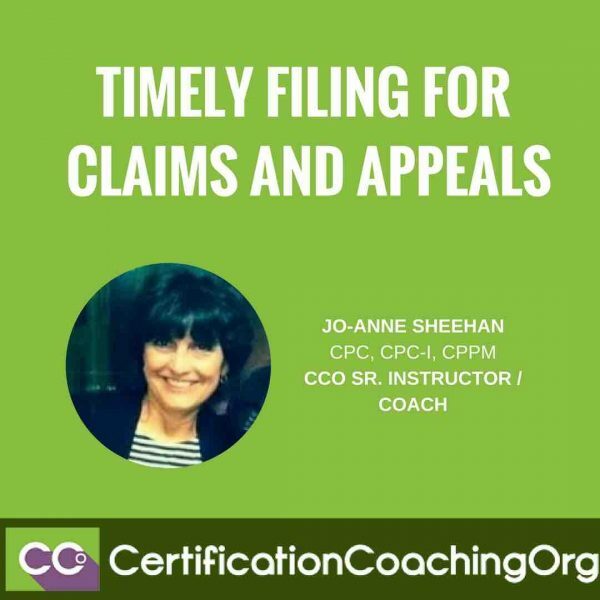 Q: Timely Filing for Claims and Appeals — “Please explain filing limits with insurance claim processing” for the initial claim as well as the appeal process. A: Basically, we’ll be covering information about how all insurance companies do enforce filing limits for both initial claim submission, as well as for appealing claims. 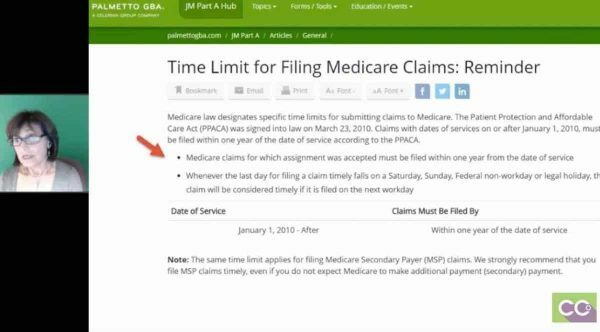 So, you really need to know your payer filing limits and create a cheat sheet for your demographic area. When filing or appealing a claim, you want to be absolutely sure that you get those claims in early because there were always technical problems or if you’re using snail mail, things get lost in the mail. It happens more often than not, so if a doctor gives you a charge today and expects you to transmit it tonight and thinks it’s going to be OK because the cutoff is tomorrow, I can bet you that it didn’t go through for some reason. There’s always a delay and the insurance companies do look for specific proof of when they received it in order for you to get paid. You want to pay also attention to notifications of changes regarding time constraints. For years, we were dealing with a year and a half with Medicare and then they changed to one year submission, so pay attention to any of your payer’s notifications because they will send them to you via email if you sign up on their website. Lastly, when you do your aging, the follow-up – I can’t say it enough, just pay attention to your follow-up because you can see trends there, as far as claims not being paid and you can see “Gee, if this whole bunch didn’t get paid, there might be a problem,” and so forth. Filing limit – I can’t stress enough. 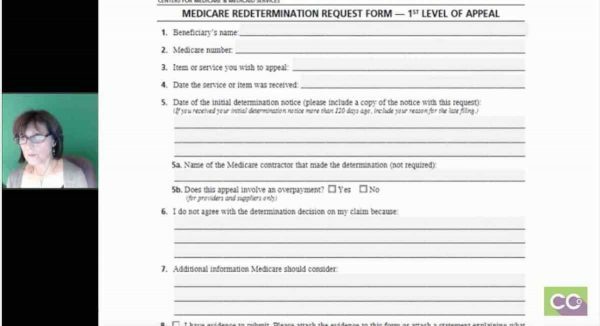 Below (on the answer sheet) is an example of how this particular payer, which is TRICARE, allows 90 days from the date of service to bill out claim but the biller really has to know all the filing rules! In this particular case, we see at the top that the date of the notice when the doctor got paid was May 15, 2006 and below where the other red arrow is, it shows date of service is April 08, 2006, and it was paid; so it clearly is showing me that the biller had the work and transmitted it right away and TRICARE paid it. What I do want to point out is that for any reason this claim is denied or there was any type of issue with it, if you were appealing to TRICARE, you would have 90 days to appeal from the date that the explanation of benefit was dated; so you’re not going to go 90 days from the date of service but from the actual notice or EOB. 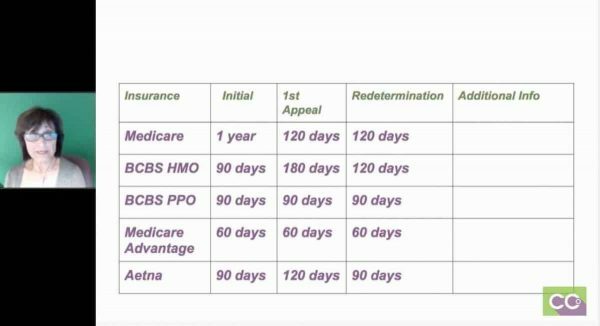 So, the May 15 th , you would tap on 90 days, and if it’s a secondary insurance, it might be 60 days, it could be a year, and whatever it is, you have that amount of time from the date of the original either payment or denial of an EOB. What I did just so that you all understand is that Google is a wonderful thing, and I just wanted to point out that when you know, when you’re working for a practice, what payers are dealing with, whether it’s California or Massachusetts, go into those payer websites. This example was TRICARE because I showed you that Explanation of Benefits, I just happened to find these guidelines and they were current. It basically said that: TRICARE network providers must file all claims within 90 days of the date of service. Where TRICARE is the secondary payer, the 90 days will begin after the first initial claim paid. If Medicare was primary and they paid today’s date, you would have 90 days from today’s date to bill out TRICARE. If TRICARE denied you would have 90 days from this denial to appeal. Also, non-network providers may file claims up to one year after the date of service. That really is up to the biller to find out because a lot of doctors that are in networks of particular payers, they are usually affiliated with hospitals that are either involved in the network or not. Only you will know best and that’s why I really stress you have to check it out. 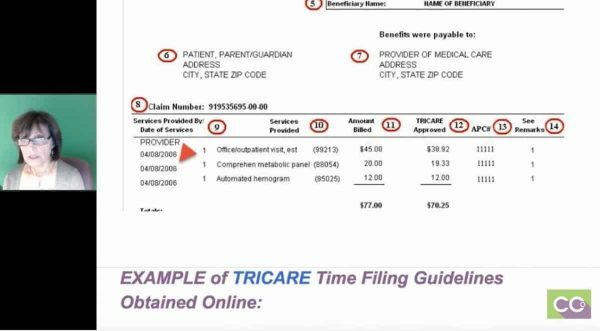 Another example here just to show you very quickly is the Basic Claims Processing Times and the different guidelines with TRICARE. Most clean claims will process within 30 days and generally, if a clean claim goes over the 30 days, they will pay you interest. That’s pretty standard with most insurances. Then they give you the criteria for clean claims: complying with the billing guidelines and requirements. Having no defects or improprieties on a claim, including documentation if it’s applicable, and also do not require a special processing that would prevent timely payment. If you have any problems with your EOBs, whether you don’t think they paid enough or anything, TRICARE gives you a website that you can register on and you get a username and password and you can access all your doctor’s information, or you can call voice recognition and call a number and speak to someone. That’s just telling you a little bit more about how to process a claim. Next page, what I did is just showed you an example. There are multiple contractors that process Medicare claims. In my area and another areas in the United States, NGS is one of the contractors. What I wanted to do is just show you that not only do they give you information about where you have to file how many days you have, but if you look here, it gives you all the information on how to appeal a claim and if you look to the left it will say: Who May File An Appeal, Levels of Appeals and Time Limits for Filing, and it even explains Reopening and Redetermination. Reopening is very basic, you messed up on a diagnosis code, you forgot a modifier, something very basic. Redetermination – you may feel that obstetrical procedure that’s not typically bundled into another procedure, should have been paid or something, and it gives you all the guidelines. 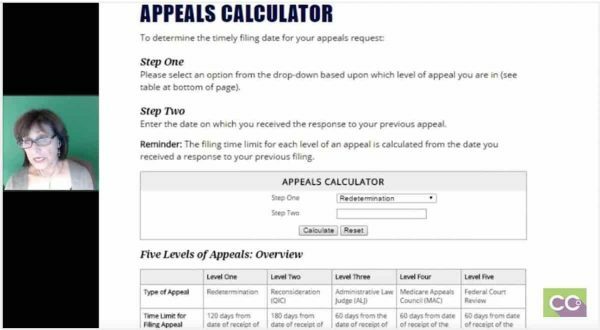 If you look to the right of this, you’ll see this in Appeals Timeliness Calculator, which I’ll show you next, as well as appeal forms. That is with any Medicare website and pretty much every other insurance company, it may look different but the information is the same. The next page has to do with just basically the appeals calculator. Again, I won’t go into big detail, but you have your option of picking if it’s a reopening, redetermination, and it tells you the amount of days that you have to appeal, like, 120 days or whatever. Again, all your carriers will give you this information. This is just an example of what’s available on the websites. The next one is just a very simple explanation of what a redetermination is, and it’s just giving you the filing limits again, how many days, time limit to initiate a redetermination, you have 120 days from the date of receipt of the initial determination, which is the EOB. Once they come up with the determination, you are not happy with it, you have 60 days to apply again, and it just gives you more information. It also tells you, a little bit below on this page, that you just submit your redeterminations online but you can do them on mail. The next page, you’ll actually see a copy of a form just as an example. I won’t go through it, but it’s basically the beneficiary’s name, ID number, the reason why you are appealing, and so forth. Jo-Anne: Yes, they do. And I’ve had first-hand experience with that, so yes. Jo-Anne: It really depends. In my billing service, all the billers always coded or make sure the coding was appropriate and then they bill it out. When you’re in a big practice management within a hospital setting usually all roles are broken down, so a coder would actually be coding, but the biller they’ll have one that registers, one that does keypunching, one that does coding, one that does payment posting, and one that does problem resolution. My mindset is I like to do it all because oftentimes the left hand doesn’t know what the right hand is doing, and I like to have control when I used to bill all the time, of knowing when my claims went out, that I was responsible to leave notes against the patient’s account. But typically, the coders don’t have anything to do with the appeals process unless there’s an issue with the code that the biller may approach the coder. But that’s why a lot of billers are already coders because you will find out fast enough that you have to understand coding to a certain extent in order to understand why some of the claims are denied. Jo-Anne: I’ve never run into a time where they haven’t paid the interest, but sometimes depending, like, when we went through ICD-10, major changes where we anticipated and they tell us ahead of time that there will be delays, I’m not sure if we’ve seen interest on that. But a typical delay in payment I’ve always seen the interest given to the doctor, but again if they haven’t been paid, first of all, you want to make absolutely sure that they’re even in the system and so you can check online one or two just to make they’re there, because if they’re not there and you have a whole list of Medicare claims sitting there, then something may have happened between your office and the clearing house, or the clearing house and the payer, and that’s where I really stress to follow-up and staying on top of your work because the filing limits really do come into play and they’re not as lenient as they were even a year ago. They’re so strict, so you want to make sure that you understand. The next slide is a cheat sheet and whatever you do, do not go by my numbers, this is strictly an example, but this is what my staff always had and I used to have in a day. I would list all my key insurance companies (Medicare, BlueCross BlueShield, HMO, PPO, Medicare Advantage, one of their plans, Tufts Medicare Preferred). As you can see, the initial claims vary. At one point, BlueCross BlueShield, HMOs we only had 90 days, but their PPOs and indemnities we had a year. Now, everything is 90 days. And, their appeals vary from 90 days to 120 days, 180 days. You really have to go into the insurance companies that your providers are contracted with. If you have any plans, and I know in Massachusetts we have a few, that a 60 days you stay on those because by the time you get it and it’s transmitted and you get your EOB back, if you get it back, you don’t have a whole lot of time to play there; so those 60 days, make those a priority. You just want to allow time for technical problems. I would never submit a claim 1-5 days prior to the filing limit. Clearinghouses and payers have maintenance downtimes when no work can be transmitted. Databases crash, whether it’s the software, the clearinghouses, or the insurance companies. Regardless of when you transmit, payers consider when the claim was received. It does not matter if you sent it one day before; if there was a delay – trust me, there’s plenty of them. Things get lost in cyberspace so there’re problems; claims will be delivered late and they will deny it for over the filing limit. Billers oftentimes can appeal, but like I said, it’s very rare that they pay. If the insurance doesn’t have an electronic acknowledgement saying that they have that claim, they don’t usually work with you. As far as problems where your claim is denied and you have to file, you have to first ask yourself: Was it the front desk? Was it the patient’s fault? If the patient gave the information but the front desk was negligent, then the practice is liable if we didn’t get the information on time, so you can’t bill the patient. But if the patient came in and did not give updated information and billing companies, office will call the patient, will try to get the office to call the patient, and they finally get around to calling you four months after four bills have gone out, they’re liable. Again, your office should develop a protocol and stick to it for all your filing limit scenarios because front desk sometimes does not update their files by the time the biller gets the work, and that’s a bad practice to get into. And follow-up on claims is IMPERATIVE. Problems will jump out when you examine the dates of the outstanding claims. A lot of times you’ll see that the transmissions, even though they said they were sent weren’t, so that will keep you in line as well. That will keep you in line as well. [or coded] for a surgeon, it’s not $50, you may be talking $2500 and they won’t be happy with you. And that’s it! Laureen: Very good. I really like the graphics and showing those examples. 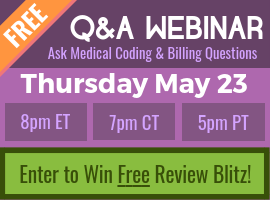 One thing I wanted to clarify that came up because we do have a lot of newbies on the call, to do coding, you don’t have to do billing and vice versa. They do complement each other, coding is a part of billing; but we don’t normally do a lot of billing topics but we’re starting to because we have a lot more billing students than we ever had and a lot of people want to have multiple skills and even though they might not actually do billing as part of their job. They want to understand all of the pieces because it makes them a more valuable employee. Some people do coding with auditing or coding and they get into risk adjustment, so there are multiple things that you can do in this industry. And because this call is kind of a hodgepodge of everything, we try and answer questions in all different areas, so for those who are currently taking our coding course and are freaking out thinking now they got to do billing, no you don’t have to. You can, if you want to have multiple certifications, they do complement each other, and it’s neat to know when you code things and off it goes to get paid, all the work that has to be done on the end of that. You’re doing the coding upfront, but then billing has to take over and get it processed and post the payments and all that fun stuff. Wonderful explanation and easy to follow examples. It is nice to hear from someone who has worked in the industry for a while and even has their own billing service. Thank you for taking the time to put this together JoAnne.